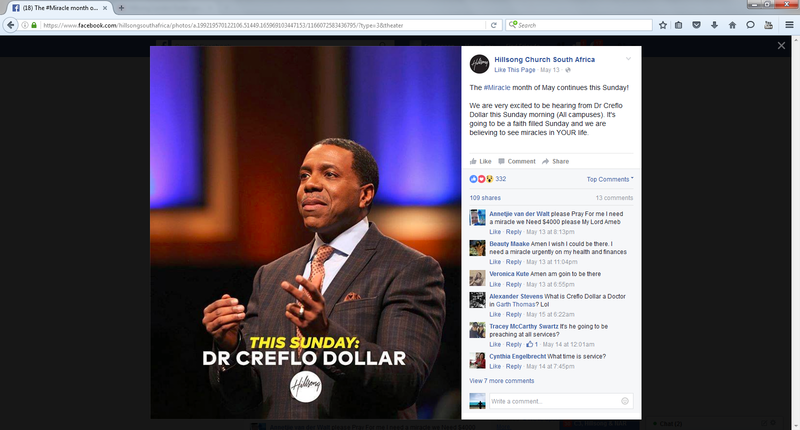 In spite of Creflo Dollar peddling the false Health and Wealth (HAW) gospel, attributing the satanic to God, peddling his Word of Faith (WOF) doctrine that we are gods and financially pimping his congregation to buy a $65 million jet, Hillsong have decided to invite this heretic to speak in Hillsong Africa. We are talking about a well-known financial “crook” who is coming to the desperate in Africa to spiritually and financially fleece them. The bible does not promote the Health and Wealth heresy or the Word of Faith heresy. They are in fact damnable according to scriptures as they preach false gospels (Galatians 1-2). The #Miracle month of May continues this Sunday! We are very excited to be hearing from Dr Creflo Dollar this Sunday morning (All campuses). It’s going to be a faith filled Sunday and we are believing to see miracles in YOUR life. What denomination are you? And what does a naked cowboy have to do with the Gospel ? We are from a number of Christian denominations. If you want to know what we believe, please visit our ‘About’ page at the very top of this site. You do not have a clue what you talking about.